Step right into the hippest vacation rental in downtown Savannah and fit right in! This cool, modern space located in the heart of the historic district is the ideal place to spend a restful vacation in Savannah within walking distance of major landmarks...leave your car and stroll through the tree-lined streets to the Civic Center, Soho Cafe, Forsyth Park, River Street, and tons of other things to view and see during your visit in Savannah! It has two dedicated, private parking spaces, a rare find in the downtown area. 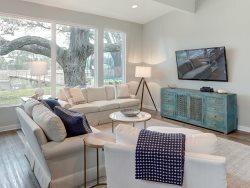 The Hip Savannah Pad features a large, modern living room area with a flatscreen TV, decorative fireplace, and plenty of seating as well as a futon. There is also a wide-open kitchen with a writing desk, breakfast area, lots of storage, four-burner range, and all appliances you need to cook an incredibly tasty meal. This home sleeps a maximum of 4 people in two large bedrooms with Queen sized beds, bedside tables with reading lamps, flatscreen TVs, and closets. There is a shared full bath in this home that has central heat & air as well as free Wi-fi and an on-site washer/dryer. Thoroughly enjoyed my stay in Savannah. Looking forward to visiting again soon! Was terrific place to still have a family holiday while displaced for the holiday. Just about every little thing ga person would have at their own home was available and in good repair so it felt like a true home away from home! The Southern Belle team was always helpful when we contacted them, both before our trip and while we were there. The Hip Pad is in the perfect location. You can easily walk just about anywhere in the Historic District We loved walking to dinner under the canopy of magnificent oaks dripping with Spanish Moss each night. Savannah is a magical place to visit and our week at The Hip Pad couldn't have been better! Very clean and so convenient to both Broughton street and Forsythe park. Truly the best location!! We loved the Hip Pad. The location was perfect for us. It was clean and decorated with a delightful mix of modern and old. Im so glad we found this wonderful little gem. We hope to be back soon! The Southern Belle team was very helpful. I used them daily to book a table at a restaurant for the evening, and they came through very quickly and efficiently. We loved the Hip Pad. Very convenient, stylish, comfortable, with all the amenities. I would recommend it highly.